Application typically opens 1-2 months prior to the session start date. 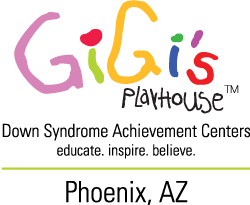 For more information regarding GiGi Prep or GiGi U programs, please contact the Playhouse. The GiGi’s Career Development Programs are progressive learning programs. They are designed to motivate adults with Down syndrome to achieve their highest potential in the world through innovative, educational, goal-development and small group skills instruction, health and wellness, career skills, empowerment, community engagement and exceptional work opportunities. GiGi’s Playhouse offers a three-tiered career development program that prepares adults with Down syndrome to gain meaningful employment/volunteerism in their respective communities. Social focus is to help communities gain a stronger understanding that promotes an environment of inclusion and acceptance for individuals with Down syndrome. To remove potential barriers for our families, participation in these programs is at NO COST to our participants. GiGi’s Career Development Programs have various positive impacts on adults with Down syndrome and on the community at large. Every interaction and friendly conversation reminds the community that stereotypes and discrimination toward people with Down syndrome must change. In doing so, more employers will seriously consider hiring ready and willing candidates with Down syndrome allowing communities, companies and people to grow stronger together. Recommended for adults with Down syndrome age 18 and up. Increase self-confidence:   The GiGi U learning program is an environment where each lesson promotes communication skills, self-advocacy and personal accountability through goal-oriented activities. These activities help to significantly improve meaningful family, friend and community interactions as well as further promoting independence. Increase career skill knowledge:   GiGi U teaches students appropriate and proactive work place behaviors by applying best practices in areas of customer service and team building. Students participate in community projects to apply their skills by volunteering to better prepare for work opportunities. Increase personal wellness:   Through physical fitness, nutrition and safety awareness training, GiGi U students gain a stronger sense of the importance of remaining active and making choices that promote and sustain a lifelong healthy lifestyle. Increased  quality of life:  GiGi U provides a hands on, multi-sensory learning environment to help students live a well-rounded, healthy, confident and fully enriching life. Depending less on those around them and by promoting their voice, students improved their presence inside and out of the GiGi’s community. GiGi Prep programs are progressive learning program for adults, compromised of modular programs that meet multiple times each week for 6-10 weeks in length that encompass Confident U, Healthy U, and Whole U.
GiGi Prep  –  Our GiGi Prep program has an emphasis on building communication skills, money management, customer service skills, team building and wellness. This program is an application based program with high expectations to motivate adults with Down syndrome. GiGi’s Prep is designed for individuals aspiring to enroll in our GiGi University program and continue on the career development path to participant in the GiGi University Internship Program. However a participant may need repetition of this course before moving on. Adults will meet with a program leader prior to start of the program for an interview. Recommended for ages 18+. GiGi University (GiGi U)  –  A comprehensive and progressive learning program tailored specifically for adults with Down syndrome compromised of a 15-week instructional program. GiGi U is designed to motivate adults with Down syndrome to achieve their highest potential in the real world while developing their abilities in the areas of wellness, communication and career skills with emphasis on job interviewing, communication skills, money management, public speaking, customer service, computer skills, team building and wellness. The ideal candidate will be highly goal-oriented and motivated to achieve a new level of personal success. GiGi U is application and interview-based. Participants will be asked to meet with the program leader prior to class and will be provided with expectations for commitment to the program. Upon successful completion of the GiGi U program and with their new preparedness and drive to succeed, graduates then move on to our live retail environment within the career studio as interns. The skills gained at GiGi U will resonate with graduates throughout their careers. GiGi’s Internship –  During the 300-hour career training program, interns will continue developing the skills newly learned at GiGi U. Each will manage different aspects of a real-life retail environment- from managing money transactions to customer service to inventory control, to fulfilling online orders, safe food handling skills, employee training and more. Support staff also provides assistance in job preparation skills via mock interviews. Throughout this internship, interns receive individualized, hands-on training applicable to a variety of work experiences through community engagement which leads to the achievement of goals through work or volunteer experiences. Various volunteer engagements are made available for future career opportunities for communities to support the overall broadening of Down syndrome awareness through engagement efforts. At the conclusion of the internship, interns receive referrals to potential fields of employment or volunteer, based on their strengths and interests-all with the goal of partnering with the family to help participants obtain a community-based placement. We continue to support participants by communicating with their employers to ensure the growth, development, and success of their employees. We also maintain contact with employees in the form of coaching and continued support where needed. GiGi’s Studio and GiGi’s Studio Boutique –  GiGi’s Studio offers a variety of one-of-a-kind, handmade and heartfelt art pieces and home décor created by individuals with Down syndrome. Adults with Down syndrome who have graduated from GiGi U, now referred to as interns are involved in running ALL aspects of the business including artwork and graphic design, production of fused glass, packaging, customer service, community outreach, and sales.